1. CAPTURING. “Begin with the end in mind,” is excellent advice as you begin to lay the foundation of your video workflow. In other words, what are you shooting and why? The answer to this question will inform both production and post production decisions and set you up for success in delivering a final product. Will you be shooting raw or log? If you’re shooting raw, will it be Pro Res Raw, RED RAW, Black Magic Raw, or something else? If you’re unclear as to the benefits of raw, here’s a quick breakdown of the history of raw and what it is today. What frame rate, resolution, and aspect ratio will you be shooting? Do you have storage fast enough to play back that kind of footage reliably? Will you be working with other people during post production? If so, do you need shared storage? External hard drives and RAIDS have been an appropriate, albeit time consuming, option for most small video teams. The more people you have between external hard drives and RAIDS, however, the more time consuming it becomes to keep everyone on the same page. If you’re working with multiple people, there are logical reasons for making the switch to shared storage. When working with shared storage, you'll need to think about whether you need to edit in HD, 4K, or higher resolution. You'll also need to consider security, especially if working on a wider network. Once you’ve decided what storage you’re using, you need to figure out how to get the files from set into post. You’ll also want to make sure you have enough ports for any additional backups. As a practice, it’s a good idea to have 3 copies of your media in 2 different places and only edit from one. At least two of those copies should be edit ready, while one could be a longer-term backup (like Cloud Storage or LTO tape). If you don’t have enough ports, look into purchasing Thunderbolt or USB hubs. When copying footage to your storage, trying using an application that support checksum verification. This will ensure your data hasn’t been corrupted during the copy. 2. ORGANIZING. So you’ve shot your footage and copied it over to the storage of your choice. But before you start editing, it’s a good idea to get organized. Different types of projects require different organizing strategies. The primary project organization types are scripted/narrative and non-scripted/documentary. For either project type, it is a good idea to start your organization with the proper folder structure. We suggest starting with folders for Footage, Projects, Graphics, Music, Sound Effects, Documents, and Exports. For larger projects, or with footage you will be revisiting, it is a good idea to look into using a Media Asset Manager (MAM). The number of MAMs on the market are vast. You’ll want to ask yourself what you want your MAM to do for you before starting the search for the right MAM. Many people just need to catalog and search their footage. For them, something like Kyno, KeyFlow Pro or axle Video may suffice. Others require tools for transcoding and archiving. They may want to look into something like CatDV. Once you’ve organized your footage on your storage, you’ll want to create a strategy for organizing your footage inside your editing software. To learn more about organizing footage in your NLE, click here. Beyond organization, it’s helpful to know the benefits of each editing program. When working on longer projects on a team, Avid Media Composer is often first pick. For independent documentary projects, the organizational tools in Final Cut Pro X come in very handy. Adobe Premiere Pro CC is used for many independent features, half-hour television shows, 360 VR projects, and corporate video. DaVinci Resolve is starting to make waves for early adopters. 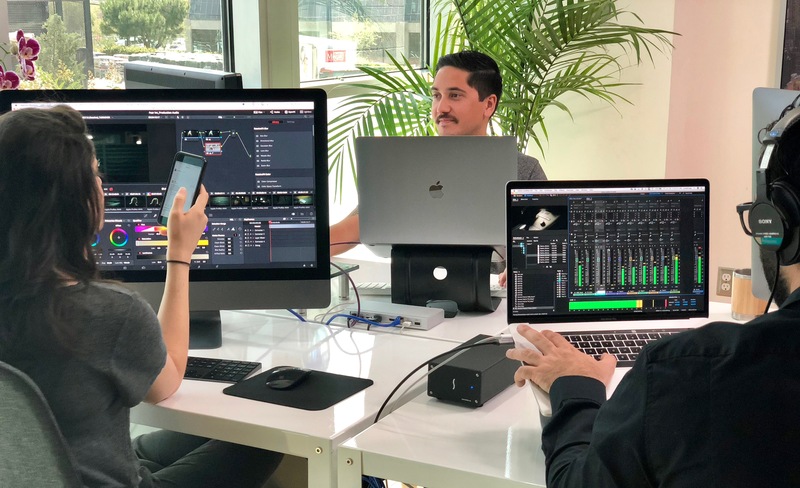 With its new editing, collaboration, audio mixing, and VFX tools, Resolve is primed to take over the commercial editing and movie trailer space. This checklist offers guidance on everything from codecs to delivery. 4. FINISHING. Finishing is multi-faceted. This is where color grading, audio mixing, titling, and visual effects come into play. On quick-turnaround or lower-budget projects, this can be done inside the editing software. However, when budget and time allow, it’s usually a good idea to work with specialized tools for each task. For visual effects, look into Blackmagic Fusion, After Effects, and Nuke. ProTools, Adobe Audition, Logic Pro X, Reaper, and Fairlight are commonly used for mixing audio. DaVinci Resolve, Assimilate Scratch and Baselight are commonly used for color grading. Moving projects from your editing software to these specialized tools is known as creating turnovers. To learn more about creating turnovers, click here. Once the color, audio, and graphics are complete, you can bring all of the elements back into your editing software to create the final delivery. Alternately, you can use an all-in-one application like DaVinci Resolve to create your final exports. If you have a complicated delivery to someone like Netflix, Hulu, iTunes, or the theater, you may need specialized software to export. There are also additional considerations when delivering High Dynamic Range projects. Learn more about how to create deliveries for streaming services, theatrical, and HDR distribution here. While video workflow is a dense topic, we hope this article gave you a framework to launch your video team from. We also hope you download this as a PDF for easy access as you tackle projects in the future or add new team members. Best of luck!